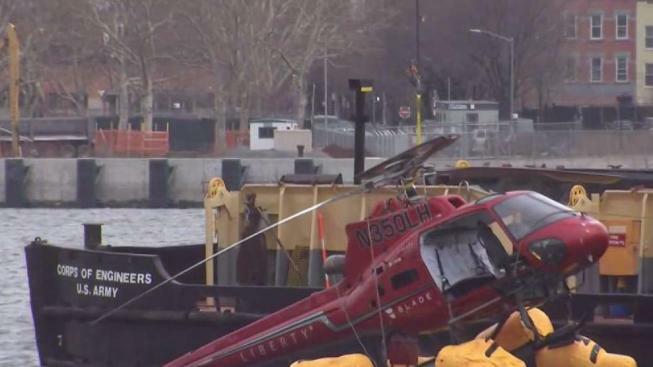 The family of one of the five people killed when a sightseeing helicopter splashed down into the East River Sunday is suing the tour company that owns the the aircraft and its pilot. In a lawsuit filed in New York supreme court, the family of Trevor Cadigan spotlights the harnesses used in the open-door flight and notes the aircraft's inflatable floats didn't keep it from flipping over and sinking. The way passengers were harnessed, with a release mechanism in the back, there "was just no prospect of safely escaping," said Gary C. Robb, a lawyer for the parents of 26-year-old Trevor Cadigan. "Hanging upside-down in frigid water — stunned by the helicopter crash, tightly harnessed, release inaccessible, with no advanced training — is a death trap," said Robb, based in Kansas City, Missouri. The suit also alleges that pilot Richard Zemke Vance failed to maintain control of the helicopter and was "negligent and careless in failing to take reasonable steps to extricate the passengers." The lawsuit seeks unspecified damages, but Robb said Cadigan's parents mainly want to end open-door flights for taking aerial photos. Liberty Helicopters hasn't responded to requests for comment and referred all inquiries to federal authorities. Vance hasn't yet commented publicly on the crash.